In every culture I am aware of, parents give their children dolls and toys to play with. 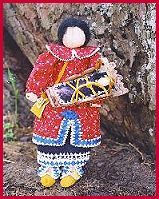 Native North America was no exception, and there are doll-making traditions in many tribes which have survived to this day. 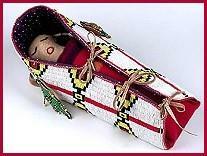 However, the idea of a child's doll as a lasting keepsake is not really traditional in a lot of Indian tribes. Dolls were usually made of perishable materials like cornhusk, palmetto fiber, or bundled pine needles; even dolls that were made out of wood or leather were not often built to last the way adult crafts were. In many tribes it was considered inappropriate to discipline a very young child, so they simply weren't given toys they weren't allowed to chew on and throw in the river. And in some tribes, the impermanence of children's dolls and toys was meaningful to parents-- as corn dolls and other childhood things naturally fell apart with time, it showed that a girl was growing up. Even though Native American dolls were not traditionally made to last, they were often beautifully adorned with miniature doll clothing and jewelry, beadwork or painting, and animal fur or even hair from the mother's head. Because native adornment and decorative patterns are so distinctive, handmade Indian dolls are distinctive as well, and today many people, adults and children alike, like to keep them as cultural collectibles as well as toys. If you are looking to buy a doll that was actually made by Native Americans--either because it's important to you to have the real thing or because you want to support native people with your purchase--then here is our list of American Indian doll-makers whose crafts are available online. Hopefully this can provide you with a good starting point. If you have a website of Indian toys and dolls to add to this list, let us know. We gladly advertise any individual native artist or native-owned art store here free of charge, provided that all dolls were made by tribally recognized American Indian, Inuit, or First Nations artists. On our main site we do our best to avoid slowing down our page loading with graphics, but this page is about art, so we'd really be remiss in not supplying a few representative doll pictures. All photos are the property of their respective artists; please visit their sites to see their work in more depth. Seneca Indian corn husk dolls for sale online. Iroquois corn husk dolls from the Oneida tribe's gift shop. Corn shuck dolls made by a Cherokee Indian artist. 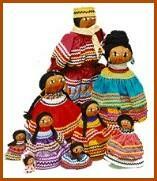 Traditional palmetto dolls dressed in Seminole patchwork clothing. These Shoshone Indian baby dolls are made of buckskin and come in miniature beaded cradleboards just like the kind real Indian babies traveled in. 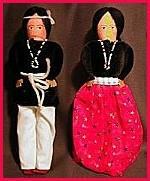 Painted cloth dolls with traditional clothing and jewelry, from a Navajo family crafts store. Colorful bags and baskets of Guatemalan worry dolls from a fair-trade Mayan craft organization. 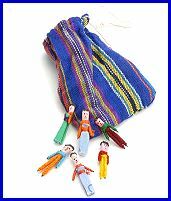 Mayan people from Guatemala make these miniature dolls (no more than an inch high) as a charm to ward off bad dreams or an evil spirit. According to some versions of the Maya worry doll legend, if you sleep with them under your pillow they will protect you in your dreams. In other versions of the story, if you tell each worry doll one of your troubles, the doll will appear in your dream and teach you how to solve it. 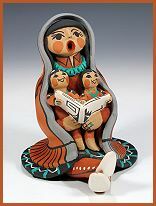 Story teller dolls or figurines are a popular type of Pueblo dolls made from clay, representing an open-mouthed woman (or sometimes a man) singing and telling stories to children. They symbolize family, tradition, and happiness. These Otoe and Cherokee artists make cute native doll regalia from several different tribes, as well as full-size regalia for people. They also carry a few fine-art porcelain dolls dressed in fully beaded white deerskin. Collectible Indian dolls made by a Lakota Sioux artist. Artistic wooden and ceramic dolls by an Inupiaq artist. 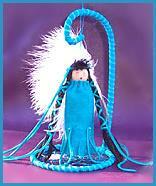 These are contemporary dolls based in traditional Inuit culture. Kachina dolls (also known as katsina or spirit dolls) are not actually dolls the way the English word is usually used; they are wooden sculptures, religious in nature, which are not used as or appropriate for children's toys. Kachina doll figures are meticulously hand-carved and painted by a small number of Hopi artists who have won the cultural honor of making them, and they are priced accordingly. 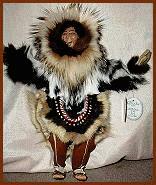 Visit our Hopi kachinas page to see examples of this beautiful art form. Fascinating art book from the National Museum of the American Indian. Illustrated history of Native Indian dolls and toys from several different tribes. This is a poster, not a book, but it has photos of forty different historical Indian dolls. Cornhusk Dolls: Description of Indian corn husk dolls with an Iroquois legend. Instructions for Making Cornhusk Dolls: Illustrated directions for how to make a corn husk doll. About us: This website belongs to Native Languages of the Americas, a non-profit organization dedicated to preserving and promoting endangered Native American languages. We are not artists ourselves, so if you are interested in buying some of the Indian dolls featured on this page, please contact the artists directly. Though we have featured only Native American dolls identified with the name and tribal affiliation of each artist, we haven't called the tribal offices to check up on any of them, and we only know a few of them personally. We also don't guarantee any of their products. This is not an exhaustive list of American Indian dolls--if you would like us to add your native doll site to this page, please contact us with your URL and tribal affiliation. We advertise any individual native artist or native-owned art business here free of charge. We do not link to dolls which are not made by tribally recognized American Indian, Inuit, or First Nations artists, so please do not ask us to. And finally, websites do occasionally expire and change hands, so use your common sense and this general rule of thumb: if the creator of each individual artwork is not identified by name and specific tribe, you are probably not looking at a genuine Native American Indian doll.